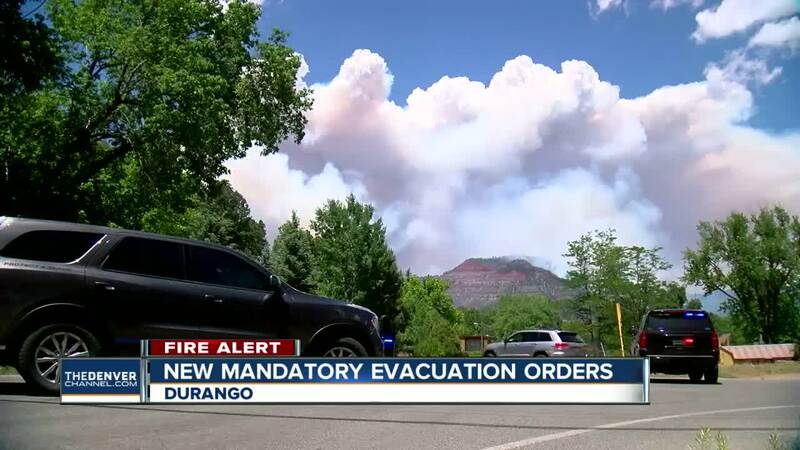 LA PLATA COUNTY, Colo. – The 416 Fire, which has been burning for over a week about ten miles north of Durango, grew over 1,500 acres overnight prompting new mandatory evacuation orders for 220 more residents in southwest Colorado. A mandatory evacuation order was issued Saturday afternoon for homes in the Falls Creek Ranch and High Meadows subdivisions and for homes on the west side of County Road 203 between Trimble Lane and Cometti/Mead Lanes. People living on the east side of County Road 203 east to the Animas River between Cometti/Mead/Albrecht Lanes south to Trimble Lane remain under pre-evacuation notice, La Plata County officials said in a press released posted to Facebook. Officials ask residents to evacuate the area as soon as possible. For up-to-date information on evacuation status, you are asked to call the La Plata County Emergency Operations Center at (970) 385-8700. You can also visit. www.co.laplata.co.us . U.S. Highway 550 remains closed from mile marker 32 to 47. Due to new evacuation notices, the highway will close the southbound lanes indefinitely during the evacuation period. For up-to-date information on road closures visit www.cotrip.org . An evacuation center and shelter is open 24 hours a day at Escalante Middle School, 141 Baker Lane, in Durango. Evacuated residents are asked to check in at the evacuation center to receive credentials for re-entry when conditions allow the evacuation order to be lifted. To sign up for CodeRED emergency alerts, click here. The wildfire, now 8,691 acres in size, remains 10 percent contained as of Saturday, fire officials said in the latest update from La Plata County. Weather will be a concern this weekend as critical conditions are expected in the area – an area which is currently experiencing “exceptional drought,” the most severe category handed out by the U.S. Drought Monitor. Southwest to west winds gusts that could potentially reach 25 mph, along with humidity values in the single digits to low teens, will also make firefighting efforts difficult Saturday. Also of concern is the Haines Index, which measures the stability and dryness of air over a fire. It’s currently at level 6, the highest most extreme value in the index, according to fire officials. “This indicates that there is a high potential for extreme fire behavior, intensity and growth,” said Todd Pechota, with the Rocky Mountain Incident Management Team, the crew currently handling the 416 Fire. On Saturday, more firefighters will be tasked with patrolling the perimeter adjacent to U.S. Highway 550 from Division A/Z break north. They will focus on mopping up any hotspots to keep the fire west of the highway and away from nearby homes. In Division A, firefighters will continue to strengthen indirect firelines and scout additional fireline locations to protect homes and other infrastructure in the Hermosa community. In Division D, more firefighters have been brought up to scout fireline locations. Other firefighters will continue to keep an eye on the west wide of the fire in Division H and look at suppression options. Firefighters in Division X are currently building indirect fireline and thinning fuels to create a fire break. Officials said this is being done to prevent the fire from impacting Purgatory Resort. 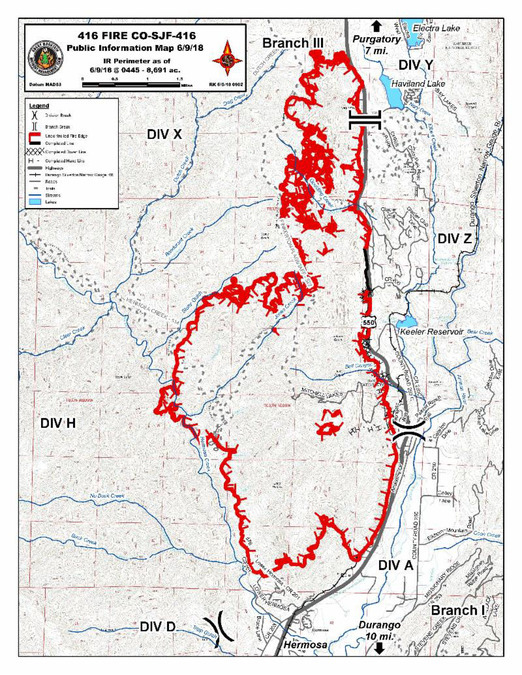 View the most recent map of the fire embedded below. Officials said early Saturday that a community meeting is scheduled for 6 p.m. at the La Plata County Fairgrounds. A total of 683 firefighters are battling the 416 Fire in southwest Colorado. Ground resources include eight Type 1 hand crews, nine Type 2 hand crews, 28 engines, four dozers, five water tenders, and one feller buncher. Aerial support helping fight the blaze includes four Type 1, two Type 2 and three Type 3 helicopters, as well as three airtankers.